The art of calligraphy in India perhaps began in second century AD where the language was transferred on bhojpatra which was used as the writing surface. Arunoday Singh and his work. 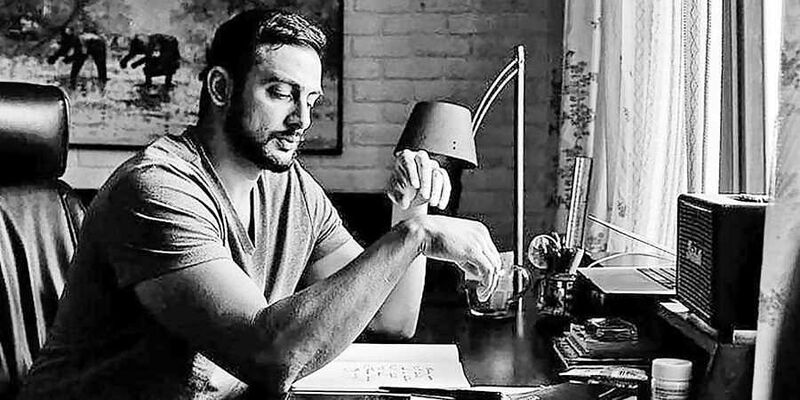 Remember the semi-autobiographical socio-political drama, Buddha In A Traffic Jam, with Arunoday Singh as the protagonist. Well, this is no piece on Bollywood but a unique passion the talented actor diligently follows in his personal life — calligraphy. Though Arunoday(@sufisoul) says he is not a calligrapher, he has decent handwriting which he has been working at and writing constantly with over the last few years. “I find the act of making a pen flow across a page meditative. I write better when I write with a pen,” he says. The art of calligraphy in India perhaps began in second century AD where the language was transferred on bhojpatra which was used as the writing surface. Palm leaves were the most commonly used leaves as their surface was perfect for writing with a wooden pen. It developed over a period of time, with religious texts becoming the most frequent vehicle for calligraphy in India. Over a billion people across the globe come to Instagram every day— to love, laugh, share and connect over common interests. The community has become a melting pot where diverse cultures, art forms and talents come together, and calligraphy is one of them. It indeed has the potential to give visual expression to emotions, something that a lot of other art forms strive for. Though calligraphy in modern times is used as an art form, it was a mode of communication before the 16th century. Something with which Arunoday agrees. “Calligraphy is a tether to an older, more graceful period in human history. There is a continuity of beauty and art running through calligraphy as far as the written word existed, I think. To write well is one thing and to make the written words beautiful adds to the beauty,” he says. Does calligraphy provide visual expression to emotions to leave an everlasting impact? “I like to think of calligraphy as the art of freeing letters and getting them to dance. One of the most basic motives of dance is expression and communication of emotion. Letters, when they dance, do just that. 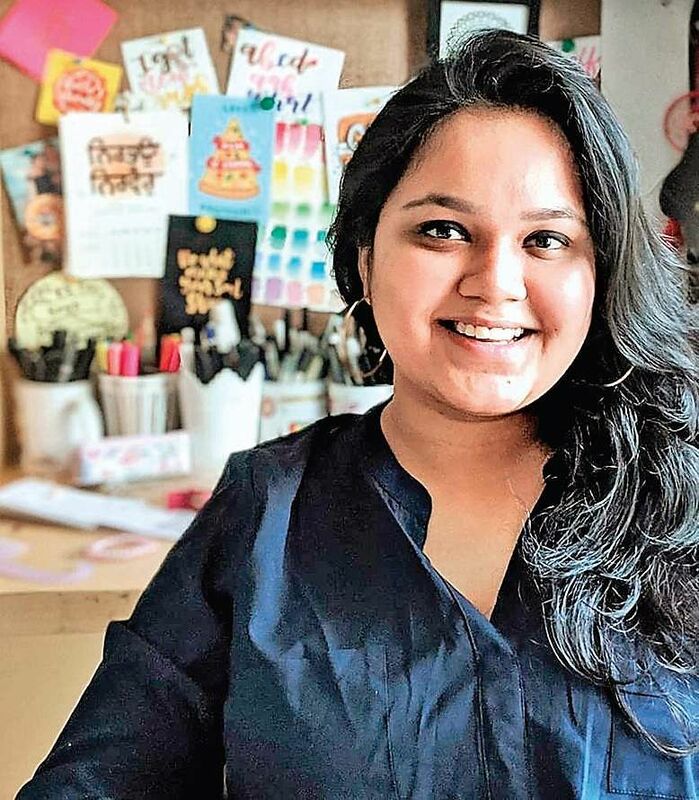 The way the letters are designed and written always convey emotions and leave an impact,” avers Bhavika Malhotra (@theinkaffair) who conducts calligraphy workshops across the country to help people learn the art. This is a fact with which calligrapher and hand-lettering and mandala artist Sadhika (@delhidoodler08) Gupta agree. “Calligraphy, if done well, has the potential to create a long-lasting impact and even leave the viewers awestruck. For example, if a love letter is printed in Times New Roman font, and another is calligraphed with utmost passion, the latter is likely to create a better impact because it shows that whoever has written it has spent hours writing it carefully and done it seriously,” she says. Sadhika picked up the art of calligraphy as a hobby after completing her graduation around four years back. “I saw some accounts on Instagram doing brush calligraphy. The simplicity and the beauty with which they were done attracted me. I started following them and learnt about the tools and started practising it with brush pens. Thereon, it became a hobby, then passion and now, profession,” shares Sadhika. In fact, she says calligraphy plays the role of a therapist in her life and helps her channelize her energy into making something creative. Around the time Sadhika was getting attracted to calligraphy, Bhavika was getting drawn towards the art form too. “Calligraphy is what I do for a living now and also what I do as a hobby. It is a big part of my life. I got to know about calligraphy four years back when I was scrolling through Pinterest, looking at some of the loveliest quotes designed so beautifully. I knew I had to figure out how to do it too! So I got myself a pen, started practising and that’s how my journey began,” she shares. While Sadhika and Bhavika got to know about calligraphy through social media, Avinash Kharat (@avinash_calligraphy) who specializes in handmade lettering and uses pointed pen and brush to bring calligraphy to life got introduced to the art form at a gym. “I heard one of the regulars talking about it with another visitor. He apparently taught him calligraphy. I got attracted to it,” he says. So, he started practising it with Gothic Script and then simple foundational hand script drew his attention “as it can be used for commercial work too”. “Once Professor Sashikant Pendase from JJ School of Art visited an exhibition I had put up of my works and pointed out my mistakes. He invited me to his house and showed me copperplate calligraphy. I got immensely fascinated with all of that. It has been six years now and I am still learning,” says Karat. The handmade lettering expert goes on to add that calligraphy is his life. “It gives me pleasure and peace. Every day, I explore something different and try to be better than yesterday,” he puts in. Bhavika is also of the opinion that digital era will encourage more and more people to take up calligraphy. “If it wasn’t for social media, I probably would never have taken it up myself. I think the future of calligraphy is bright and both hand-lettered and digital will coexist harmoniously,” she says.